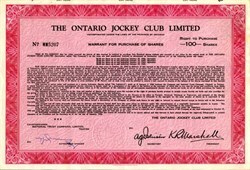 Beautiful uncancelled Warrant for Purchase of Shares Certificate from the Ontario Jockey Club, Limited issued in 1956. This historic document was printed by the American Banknote Company, Limited and has an ornate border around it with the company's name on top center. This item has the printed signatures of the Company's President, Colonel K.R. Marshall. The Ontario Jockey Club was founded in 1881 to improve the quality of horse racing in the city of Ontario, Canada. In the 19th century, the city had a few other racetracks. The Ontario Jockey Club was once operated from the Greenwood Race Track, a facility once called Woodbine Race Track. WEG employs over 2,300 people at two racetracks, casino and other off-track betting stations across the Greater Toronto Area. Woobine also owns and operates the Canadian digital television service, HPItv and operates Canada's only online wagering platform for horse racing HorsePlayer Interactive.